My family moved from sunny Santa Rosa to dreary Daly City 44 years ago. It was a week before my 12th birthday. It was an unannounced move. I was so upset that I wasn’t going on to junior high school with my elementary school classmates. I was upset that we moved from a one block street in a small town with apple orchards to the largest suburb of San Francisco on a street that extended several miles with little look-a-like houses with a compensatory close up view of the ocean. We left gorgeous weather for fog drenched days. It took me many years to get over that move. But I did. For one, we were so close to the ocean, Joe Montana could probably throw a Hail Mary to the water. I spent many afternoons down at the cliffs getting to know the bluffs, the billowing wind and the beautiful view. Over the decades, I have come to love this coast. And when I got to a “certain” age, I came to love the fog. There is no place a menopausal woman could be happier than on the Daly City/Pacifica coast. I am more alive when the king tides are crashing against the pier, the wind howling over the hills and the fog dripping everywhere. All that I love to do is activated by this weather: reading, writing and baking. We’ve had a heat wave these past few days. 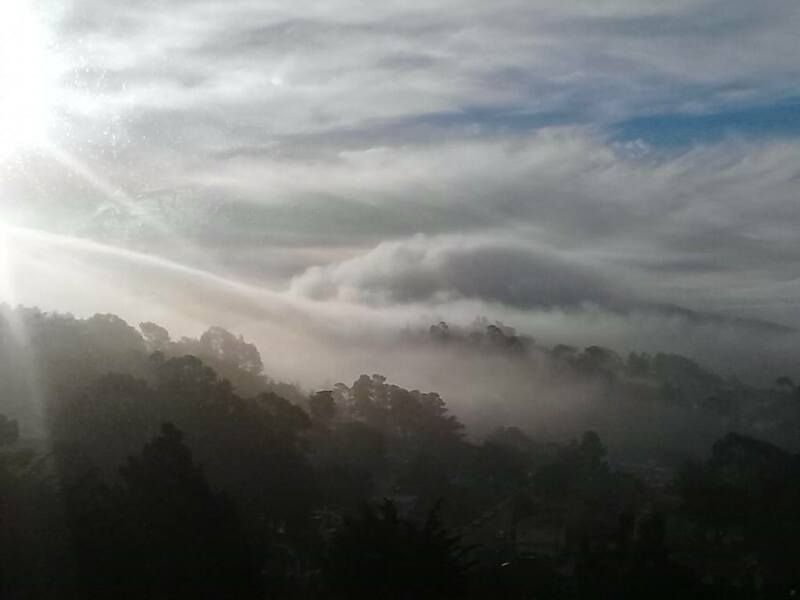 When I lived in the East Bay during a heat wave, I would call my sister everyday for a fog report. Where was the fog? Is it coming in? Sometimes, on my porch over there, I’d get a whiff of a cool molecule and I’d know it had rolled in. My sister just called me. She was excited, what was going on?….the fog is coming in, she announced. You see, we don’t own air conditioners out here, we wilt in the heat, so we have come to rely on this wonderful creation to cool our bodies when the pressure gets high. We are continually baptized in this billowy cloud of refreshment. So, look up, folks, your refreshment draweth nigh! The fog is returning.